I read contemporary fiction very rarely these days, so I’d better be damned impressed when I do. As a sucker for titles, I was curious about Kerry Dunn’s Joe Peace right off the bat. Wary after seeing that the book was a crime story told in first-person narrative, I started reading, hoping not to have to endure half-baked (half-boiled?) Nicholas Pileggi or Chandler/Hammett fare. My fears faded after only the first couple pages. First of all, I’m much more partial to Mickey Spillane than Raymond and Dashiell, so Dunn’s quick-witted but rough-edged style for the narrating protagonist felt like home – without being annoyingly derivative. Instead, the lingo (clever similes and street-/pop-culture-wise metaphorizing) is respectfully emulous of the hardboiled tradition, showing off Dunn’s good ear for inner and outer speech. Though Peace can be a real scumbag, and not every aspect of the character impresses me, there’s enough introspection, eclectic knowledge, sense of humor and irony to make him charming without risking incredulity (though his mindrobatics could be considered too slick by some readers). His desire to balance out the stupid and ruthless decisions he’s made in his hollow life, his intense reverence for his lost love, and his pursuit of atonement and redemption are the stuff of heroes. Not that his redemptive methods are those of a Joe Friday or a white-hatted Ranger. “To get away clean, you have to play dirty” goes the cheesy-but-true tagline for the action flick Parker (yet another movie in which Jason Statham plays Jason Statham). Sometimes rules need to be bent to get things straight. For you sticklers of just deserts, Dunn provides his conflicted character with an indirect, rather banal comeuppance (which underscores Peace’s progressive shedding of blinding, selfish pride), but I won’t reveal what that is. I was always aware of the tectonic plates in my head, shifting around…[S]ometimes huge fissures would erupt, and echoes like buildings collapsing to rubble shook my foundation. Every good rags-to-riches-to-roaches story illustrates the futility of grasping the Real object of Joy and the inevitable failure to obtain utopia, even a criminal one. Not so deep down we know that we’re on a dead-end road when all we desire is desire itself. There’s always a sense of loss and unrest. 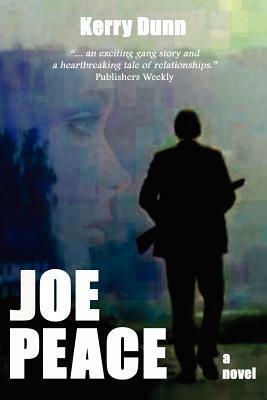 Even Joe Peace’s surname hints at this (with all the subtlety of a grand piano), evoking the Jewish-bible line about saying “Peace, peace” when there is no peace. The ultimate lesson after a life of crime and self-destructiveness? Hell is not necessarily other people. It’s often yourself. And home may be where the hurt is, but it’s also where the heart is. As the final line in the book goes: “It’s where the people you love reside.” To continue my lousy punning, I say give Joe Peace a chance. Some of my favorite lines in the book follow.